1. Line a baking tray with non-stick baking parchment. Push a lolly stick into the cut end of each banana half. 2. Place the sugar in a medium saucepan with 100ml water and heat gently until the sugar has dissolved. Stir in the vinegar, golden syrup and butter. Bring to the boil and cook without stirring for about 10 minutes until it reaches 138ºC on a sugar thermometer, which is 'hard crack' stage. If you don’t have a sugar thermometer, after 10 minutes drop a little into a bowl of cold water and it should harden into a ball. 3. When the toffee is ready, carefully dip the bananas one at a time into the hot syrup, turning each one around until fully coated. Remove from the pan and keep turning while sprinkling with a few chocolate-flavoured strands. You have to work quickly at this stage as the toffee hardens rapidly. Place the bananas on the baking parchment and leave to cool and set completely. 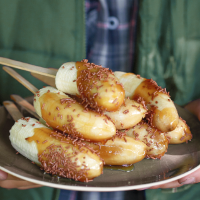 Make sure you serve the toffee bananas as soon as they have cooled, as the toffee starts to melt and they become soft and sticky within an hour.